For the first time in many, many months, I did not make my OMG last month. It wasn't for a lack of trying, but my brain was just not clicking last month with everything we had going on. I'm trying not to think of all the quilts I didn't finish this year, but for my One Monthly Goal, I am going to repeat last month's goal of finishing the baby quilt for my youngest sister, Liz, who is due in January. I'm hoping for a tiny birthday buddy! Last month, while I was walking around Quilt Festival in Houston, I was able to video call my sister to say hello to her during her shower. My niece gave me a tour of their new house. I took a screen shot of this pillow from the nursery for inspiration. When I got home, I drew up this pattern, which will use the bird pattern by Melinda Honn and the birdhouse pattern by Just Jude Designs. Unless, of course, I change my mind and do something completely different! What a fun quilt! 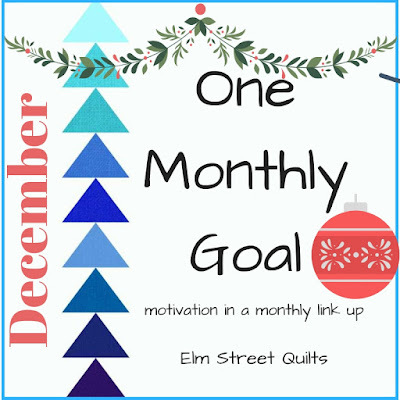 Thanks for linking up with Elm Street Quilts One Monthly Goal and good luck with your project!